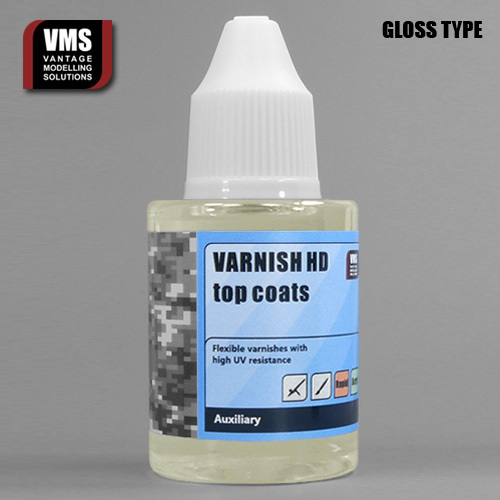 VMS Varnish HD is based on small size binder type to ensure it sprays easily to form an even layer. No spitting, no overspray, no problem! Three easy to spray (no thinning required) types: deep matt, silky satin and classic gloss. VMS Varnishes are 100% translucent - no white traces characteristic of cheap finishing products, even if sprayed in thick layers! Product quickly dries to a durable shell that will protect you model while weathering. Always perfect coat - no running or dripping guaranteed! VMS Varnish HD is able to repel unwanted particles better than standard varnishes thanks to low surface contamination factor. Dedicated to work with VMS Chip & Nick paint.